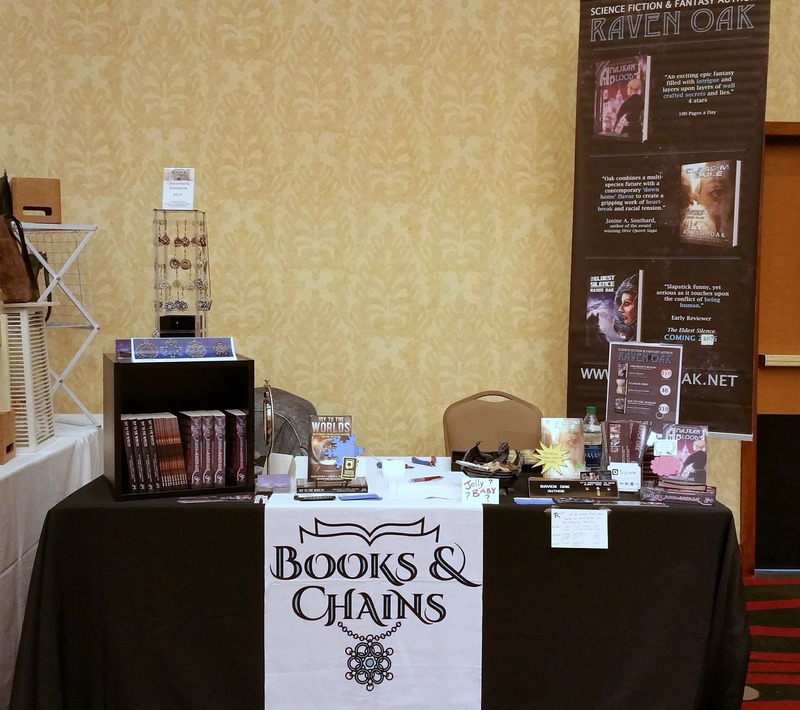 Books & Chains will be at FOOLSCAP this weekend (Feb. 3-5). Not only will Elise have some new pretties, but author Jesikah Sundin will be joining us as well! Come check out our selection of speculative fiction books and the chainmaille jewelry inspired by them! 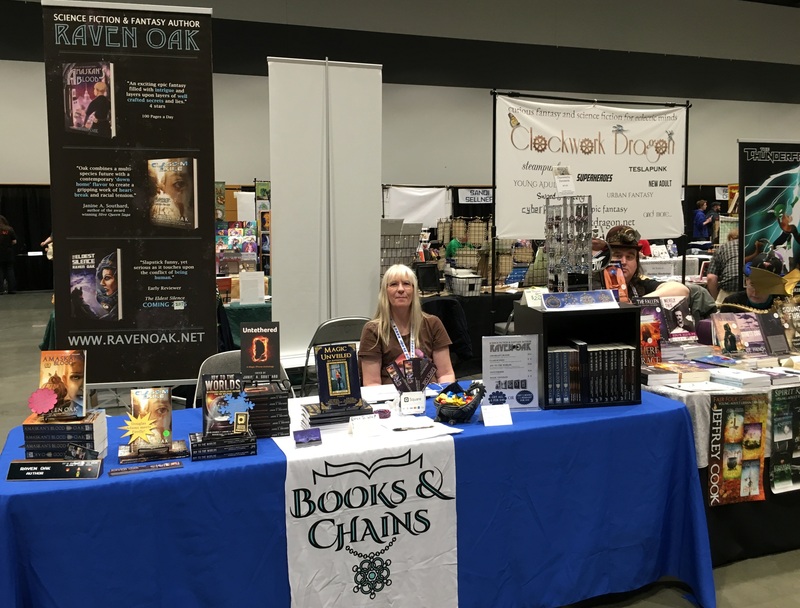 This past weekend was the Jet City Comic Show in Tacoma, WA, where we had a booth in the dealer’s hall next to our friends at Clockwork Dragon. Not only did we have Elise’s chainmaille pendants, but we also had hero-themed chainmaille earrings! We had a contest for a fidget toy, which was won by a guest who bought a copy of all Raven’s books. She went home with a lot of loot! We had a great time and are looking forward to the Oddmall Holiday Show on November 19-20 in Everett, WA. Hope to see you there! Due to the typhoon scheduled to hit WA state, Books & Chains will not be attending Central City Comicon this weekend. It is for the our safety and that of our families that we had to make this difficult decision. We apologize for any inconvenience and hope to see you at C4 next year. Elise and Raven had a fantastic time at Anglicon 2016! This was our booth at the beginning of the convention. We came out with 4 boxes of books and left with only 1! Always a great thing to have happen as a vendor. We ran out of Jelly Babies halfway through Saturday, but our booth dragon laid some “eggs” overnight for Sunday. 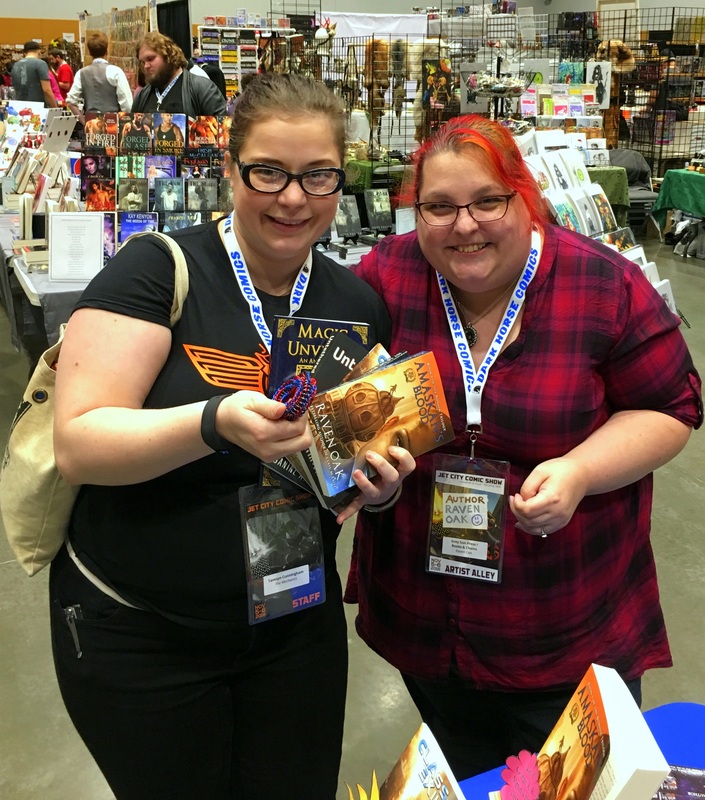 Besides selling a ton of books and chainmaille jewelry, we met some very amazing Whovians! We definitely hope to be at the next Anglicon in December 2017! Now to get stock ready for Central City Comicon in Yakima in October! We’ve been busy preparing for Anglicon this weekend! We added product pictures, a mailing list (which may eventually result in discounts or other goodies), and a few other things on the page. Feel free to explore, drop us a line, and come say hello this weekend! Comments Off on All the Updates!